Do you love the smell of brewing coffee at home when you wake up but find that you often have to take it to go so that you get to work on time? Do you enjoy stopping at your favourite coffee shop on your way to the office but find that the cups get much too hot? You could buy an expensive double layered coffee tote mug or use the paper cup sleeves provided at the coffee shop, or you could save the day with your own DIY skills! 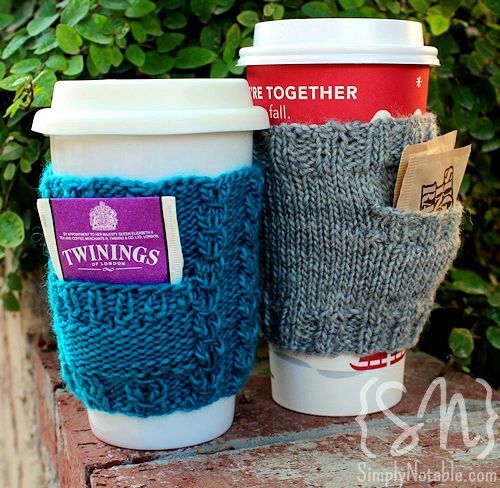 Check out these 15 adorable and totally practical coffee sleeves that are perfect for keeping your hands cool but your cup warm while you’re on the go! Hazelnuts teaches you how to make a tapered mug cozy from thick, textured fabric with a visibly chunky line of stitching through the middle and two buttons to keep it on! We love the idea of matching the colour on your stitching and buttons. Do you prefer tea to coffee, with an extra tea bag so you can have a second one throughout the day? Do you like to add your milk and sugar once you get to the office rather than letting it sit during your commute? These adorable knitted sleeves by Simply Notable feature a small pocket that’s perfect for putting spare tea bags and sugar, or even your shopping list! 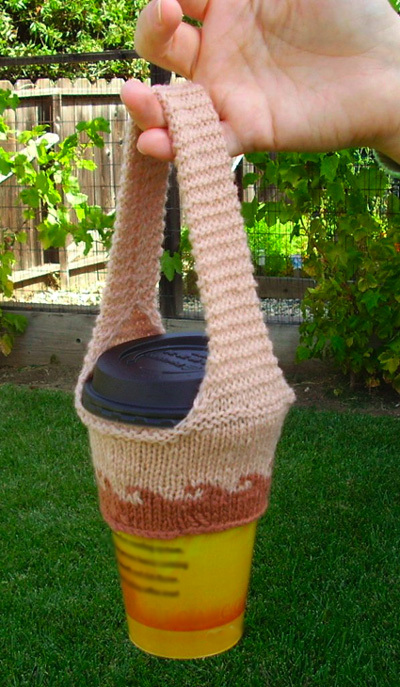 Do you love the idea of knitting yourself a coffee sleeve but you’d prefer something more cute and feminine to a pocket? Try this adorable but very simple bow pattern by How’d You Make That! Perhaps you’re making a coffee sleeve as a gift for your favourite java lover? We adore this soft, fuzzy bunched up pattern for how cute it looks, but we also love its card pocket! Place a gift card in there when you gift it and then when your friend uses it later they can keep there coffee points card in the pocket to get points each morning! Get the pattern on Clover and Violet. Are you looking for something very simple and chicly unfinished looking? 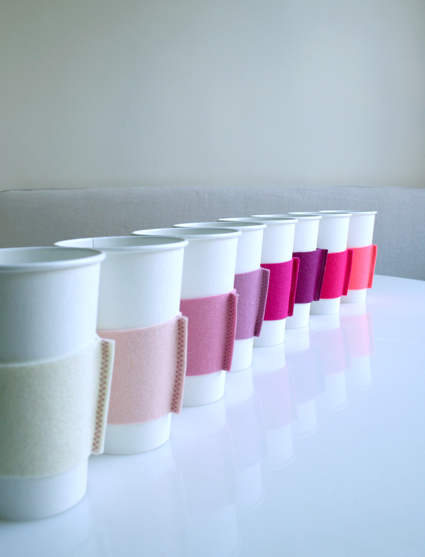 These little felt sleeves by Purl Soho keep your drink warm and your hand cool. They also feature the seams on the outside in an intentional way that looks rather Boho chic, if you ask us. Some people use coffee cozies so that they don’t have to buy a thick, insulated mug to keep their coffee warm, but perhaps you live in a very cold place that needs both! In that case, this thick transport mug sleeve by Lisa Clarke might be right up your alley! Do you love projects that upcycle and repurpose things that you already have rather than buying materials specifically for a small DIY project? Lime & Aqua has the perfect tutorial for you! These make a really cute Father’s Day gift. 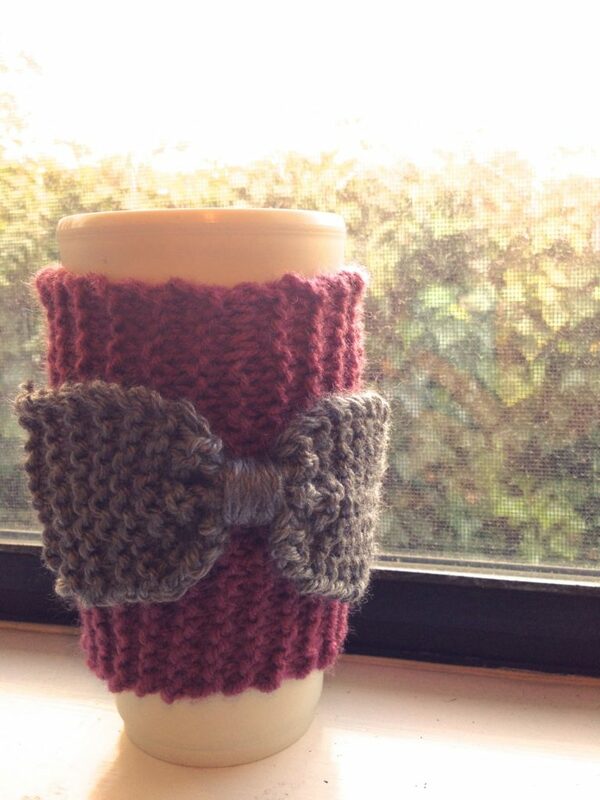 Do you like the idea of a coffee sleeve but want to make one with a little more quirky character? We love the mix of materials and textures on this little coffee cozy by Seela Made! You could choose any pattern of fabric you please if gingham isn’t your style. What’s better than making yourself something that essentially gets you two things for the price and effort of one? We sure can’t think of anything! Crafty Staci happens to agree, so check out this tutorial for making a simple buttoned coffee sleeve that’s reversible so you can choose two designs! 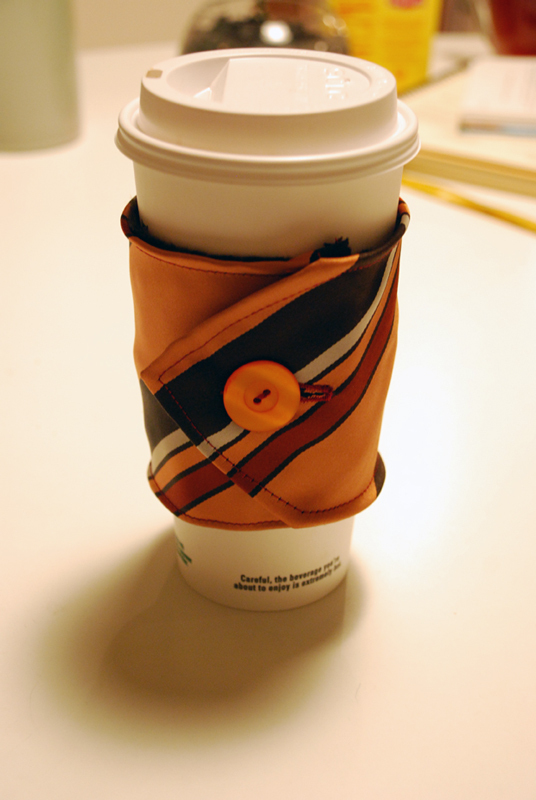 Have you had other coffee sleeves before that were too thin to really make a difference on either your hands or the temperature of your drink? Alyson’s Petals had the same problem. Check out how this extra wide sleeve is made so your drink can have a little extra insulation! Are you looking for a simple knitting project that lets you practice some basic techniques while still creating something useful? 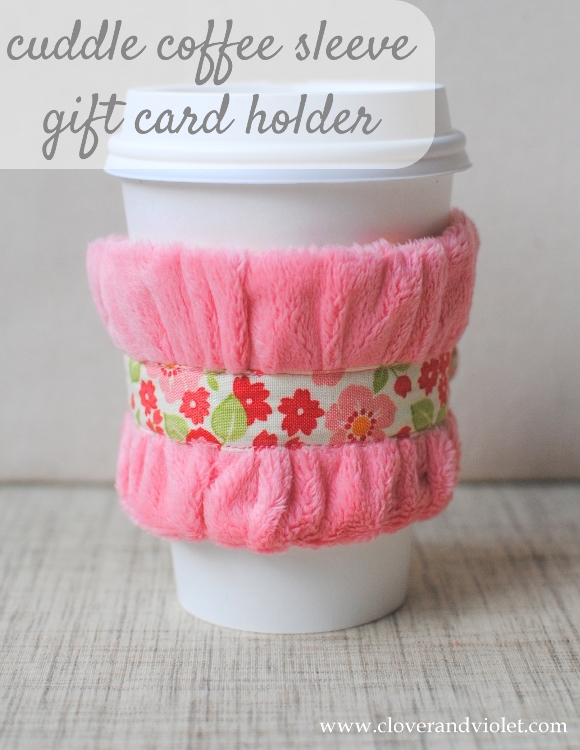 This cute coffee sleeve is the perfect thing! You’ll learn or improve upon your seed stitch technique, as well as your methods for knitting buttonholes. Get more details on Centsational Girl. Perhaps you love the look of a sleeve woven from yarn but you’re not a knitter? Many people crocheting instead! 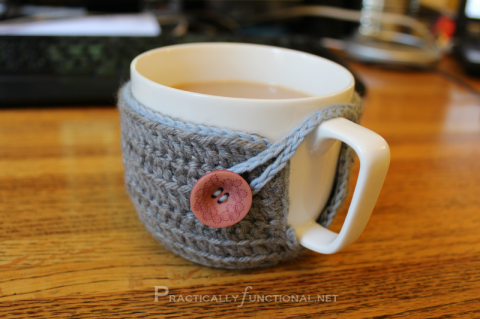 This smaller sleeve pattern by Practically Functional is perfect for your mugs that are a little more shallow than the average large coffee cup. Do you like to grab a coffee at your favourite shop wile you’re on the go, but immediately have trouble juggling it with all of the other things you have to carry? Knitty has a cute knitted solution for that problem! This little carrier hugs the top of your coffee snugly so it can hang from your hand or arm by a thick, well-knit strap, letting you carry other things more easily too! Did you like the previous seed stitch pattern but you’d rather have a sleeve for your favourite coffee mug than for your to-go cup? Setting for Four has a great pattern for you that’s subtly pretty and features gorgeous little buttons as an accent. So far, all of the knitted coffee sleeve patterns we’ve included have been quite simple and classy looking, but what if your style is a little sillier? 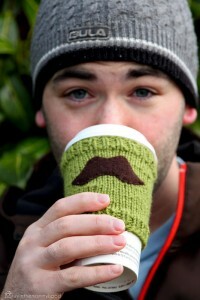 Try this hilarious little mustache coffee cozy that’ll make it look like you have facial hair each time you take a sip! Luv in the Mommyhood has the pattern for you. Do you know a coffee or tea addict who would love every single one of these sleeves? Share this post with them for a little bit of inspiration!